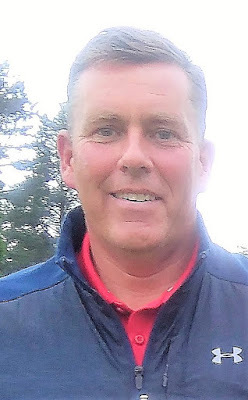 Playing conditions were perfect for the second round of the Scottish Seniors Golfing Society Spring Meeting at Powfoot Golf Club on the Solway Firth. Thursday's high winds and rain gave way to sunshine and a very light breeze, and the scoring was much lower than the first day. Joint overnight leader Stewart Henderson (Hamilton) won the Order of Merit title last year, and made an excellent start to this season by adding a two-under-par score of 69 to his opening 74 for a total of one-under143. Stewart, pictured, had a bogey-free round, highlighted by birdies at the 11th and 14th holes. He won by five shots from Paul Moultrie (Royal Troon) who had rounds of 77 and 71 for a 148 total. Paul birdied the 10th and 13th, but bogeyed the seventh and 16th for a level par round of 71 today. David Taylor (St Andrews New) was the joint overnight leader with Henderson and although he could not improve on yesterday's score he had the consolation of sharing first place in the handicap section. The three-handicapper had net scores of 71 and 73 for a total of 144. His score was matched by Ian Fraser (Dumfries and County) (3) with rounds of 73 and 71. There was a tie for third place between Robin MacPherson (Tantallon) (7) 76 69, and Alan White (Newton Stewart) (3) 75 70. Par 142 (2x71), SSS 71, CSS 74 (r/o), 71. 149 R W Smith (Nairn) 78 71, J Archibald (Luffness New) 76 73, J Aman (Grangemouth) 75 74. 150 R Jenkins (Royal Troon) 80 70, I Fraser (Dumfries and Co) 76 74, D A Taylor (St Andrews New) 74 76, D Miller (Kilmarnock Barassie) 80 70. 153 K Reilly (Silverknowes) 81 72, L Blair (Grangemouth) 79 74, D Downie (Clober) 78 75, D R Campbell (Ratho Park) 77 76, T Sirel (Largs) 80 73. 154 R Johnston (Glenbervie) 83 71, W Morton (Dunbar) 82 72, I Reid (Dumfries and Galloway) 81 73, K McAllister (S Shields) 81 73, J A Fraser (Royal Burgess) 79 75, M Reid (Sonning) 77 77, M Whatley (Southerness) 80 74.